Let me start off by saying I love insects, but I don't really know much about them. Part of the reason I'm doing this backyard biodiversity project is to learn more. The interest in insects started because I kept seeing all kinds of creatures living on the plants that I studied, both in the field and at home. This is a species that it quite common, and it is quite a hated pest. Known to harm members of the squash family, I actually found several climbing on the petals of my double-flowered green-headed coneflower (Rudbeckia laciniata). They can also exhibit a green color, particularly on the thorax, but this one was primarily yellow. 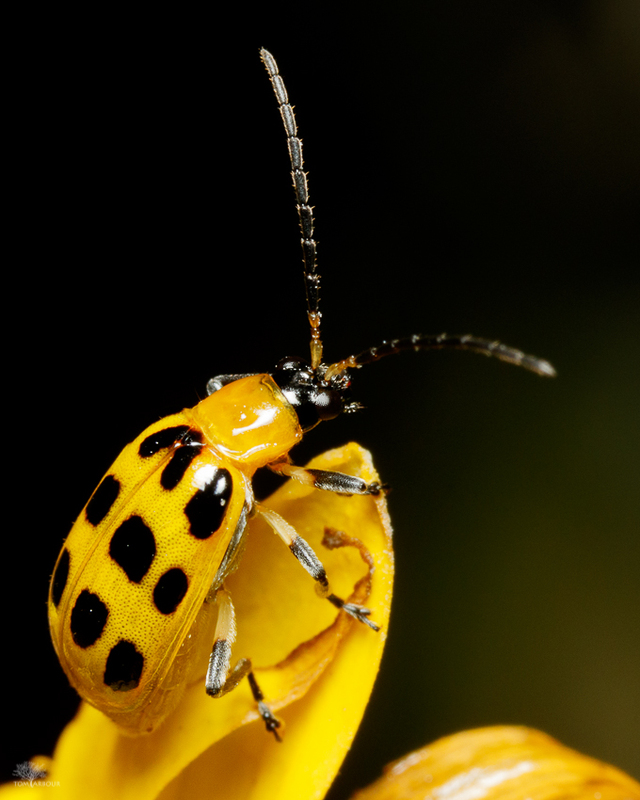 Its scientific name is Diabrotica undecimpunctata, the epithet roughly translating to "eleven spots". The "V" shaped spot counts as one spot, apparently, but doesn't it look like it's split down the middle? Who am I to argue! I've been seeing this one for years nearly everywhere I go in Ohio, and now I finally know a little bit more about this relatively common inhabitant of our backyard. To learn all about them, spending some time reading this page by the University of Florida. They can damage crop plants in many different ways. As far as I could tell, this is a native species. As always, please feel free to add your experiences and knowledge about each creature I feature in the BPP series. Thanks! Keep on the lookout! While this one was quite yellow, many of the ones I have seen have a distinct neon green coloration that is really striking.